A centrally tapped 110V transformer provides a split phase which reduces the line-to-earth voltage to just 55V. As the majority of electric shocks are caused by touching a line conductor whilst also in contact with earth (line-to-earth), this reduced voltage is significantly safer than the standard mains supply with a 230v line-to-earth voltage. There is no neutral conductor in a 110V centrally tapped earth (CTE) supply, so it is possible to receive a shock by touching either of the live conductors. Rather confusingly, yellow arctic flex usually has brown and blue conductor colours. Brown and Brown, or Brown and Black would be more appropriate to indicate the two line conductors for 110V use. As a 110v supply from a CTE transformer is a split phase, appliances should also be fitted with double pole switches. All PAT instruments can carry out earth and insulation tests on 110V equipment with the use of adaptors. Although this is probably a good option if you only have a small quantity of 110V equipment, it does have some disadvantages. For mains powered testers, there is possibility of damaging equipment by inadvertently carrying out a leakage/load test at 230V. Using a 230V tester on construction sites is usually not allowed. Battery powered testers can be used on construction sites, and there is no risk of damaging equipment, however most can only perform a low current earth continuity test. For 110V site equipment, a high current earth bond test is preferable. Metrel BetaPAT Plus / OmegaPAT Plus: Can carry out load and leakage tests at 110V or 230V depending on the supply voltage. To test 110V equipment, the test instrument needs to be powered from a 110V supply. Seaward Supernova Elite: Can carry out load and leakage tests at 110V or 230V. It can be powered by either 230V or 110V supply for 110V testing. Kewtech KT77: Can carry out load and leakage tests at 110V or 230V. Can only be powered from a 230V supply. Megger PAT420 / PAT 450: Can carry out load and leakage tests at 110V or 230V depending on the supply voltage. To test 110V equipment, the test instrument needs to be powered from a 110V supply. Martindale 2100 / MicroPAT+: Can carry out load and leakage tests at 110V or 230V depending on the supply voltage. To test 110V equipment, the test instrument needs to be powered from a 110V supply. 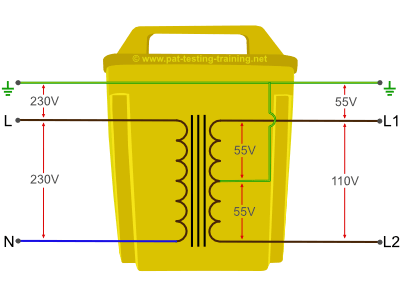 We often receive questions about testing 110V transformers. A 110V transformer is a Class I, 230V appliance. 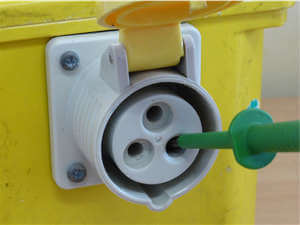 On the plastic case types, the earth bond should be taken from the earth pin on 110V socket. If the transformer has multiple sockets, an earth bond test should be carried out separately on each socket. 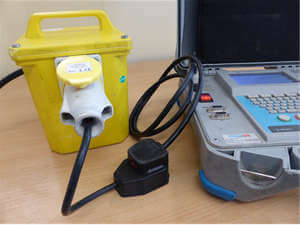 This can be done by using the test probe directly on the earth pin, or by using an adaptor (110V plug to IEC connector). The four screws securing the lid on the plastic type transformers are not earthed. For metal cased transformers, an earth bond test should be carried out on the casing as well as the 110V sockets. At 110v the current is double that of a 230V supply for the same power output, so it’s important to ensure 110V extension leads are of sufficient size. The minimum size for a 110V extension lead is 1.5mm2. These should be less than 15m and only used with transformers up to 1.5KVA. Long runs of 1.5mm2 extension leads, daisy chained together, is a fire risk. In a line (55v) to CPC fault condition, the fault current may be insufficient to operate the fuse or thermal cut out on the transformer, but it may be high enough to overload the cable. For transformers above 1.5KVA, only 2.5mm2 extension leads should be used. 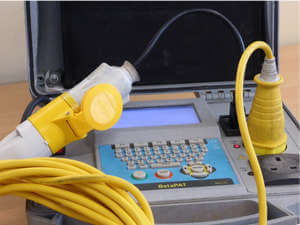 For PAT testing 110V extension leads, an adaptor with a 110V male plug to IEC connector is usually used. This will also allow a polarity test to be carried out, although the test is unnecessary for an extension connected to a CTE supply.